This piece is transparent like clear drop of water with blue floating light effect. There is an eye-visbile natural inclusion on the side of the stone. 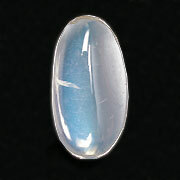 Measurements:	25.07 x 13.38 x 7.72 mm.